I’m all about speed. There are many complaints when I sew with others that the machine shakes the table. I’m not really sure why – but the peddle is to the metal when I’m sewing. I have found out though that even if I sew faster, I am not really getting my projects done any quicker. 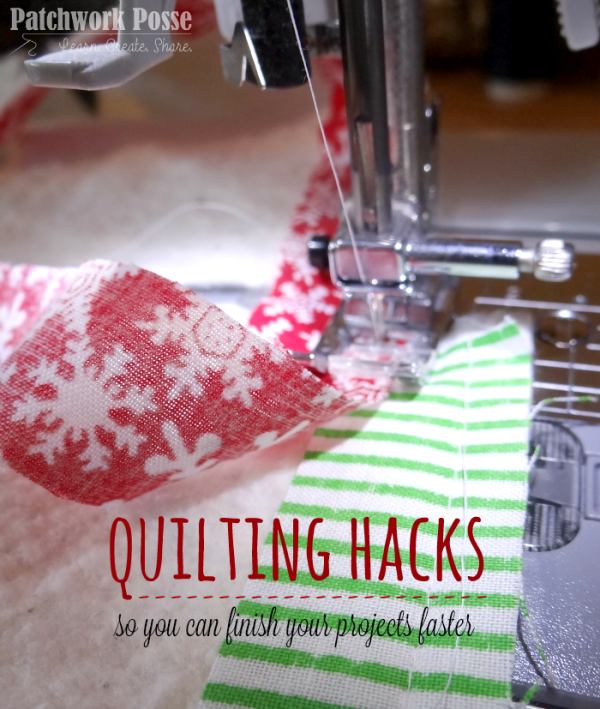 This list of quilting hacks or really things you can do to make your project get done quicker. 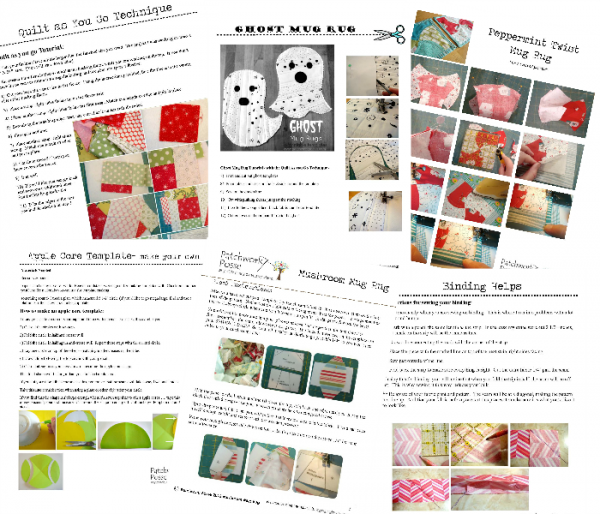 I’m in love with sewing and want you to love it too! Nothing is fun when you start this process on the wrong foot. 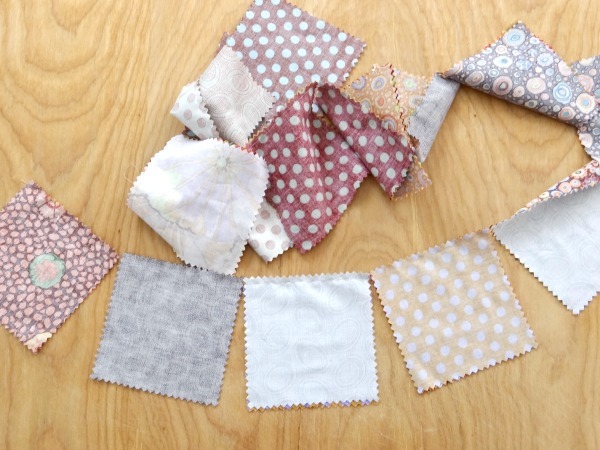 Today let’s get you started on the right foot with a few helps and hints to make you love, love quilting! Half Square Triangles – 8 at a time. Learn to do the math (might not be the most favorite part of this for many of you) but after you have it down….go to town! 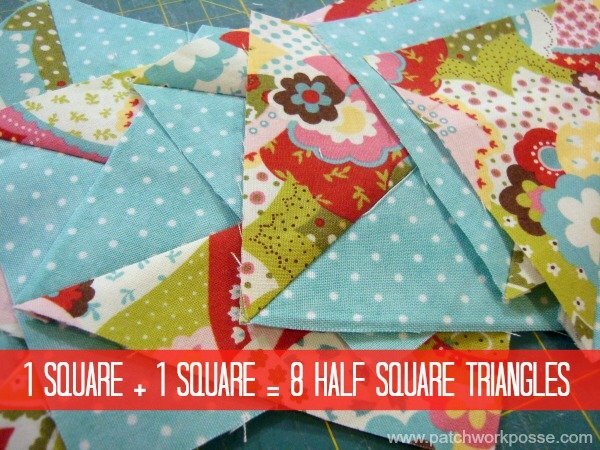 This is a super speedy method for getting a bunch of half square triangles done in no time flat. Sewing a Mile a Minute. 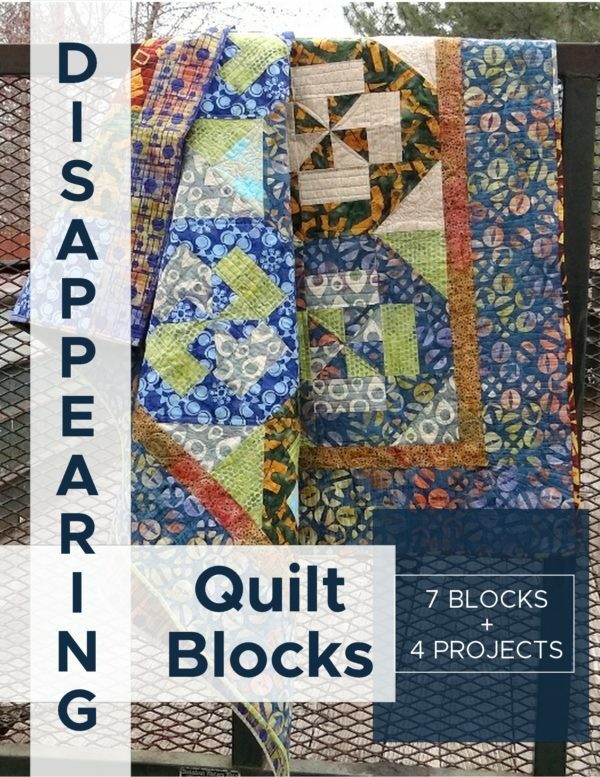 While I know that the my machine already shakes the table because I’m sewing a mile a minute– this process is actually all about taking your scraps and making them into a larger piece that you can then use for quilt blocks, borders or sashing. You name it! 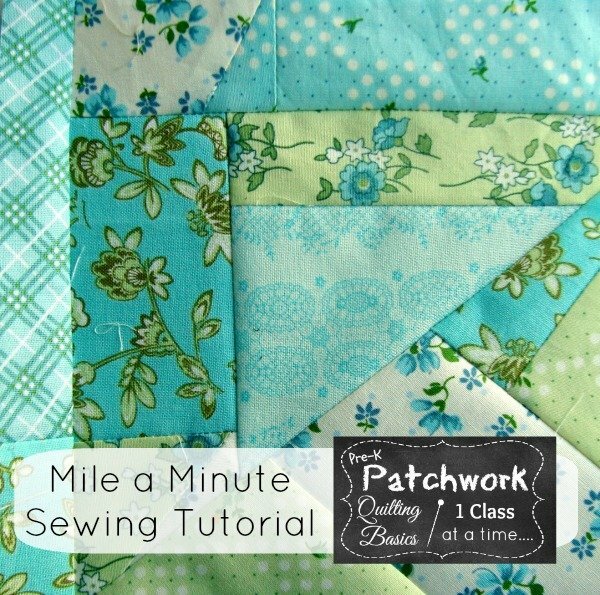 Similar to the mile a minute technique…but with this process you are using a foundation fabric. 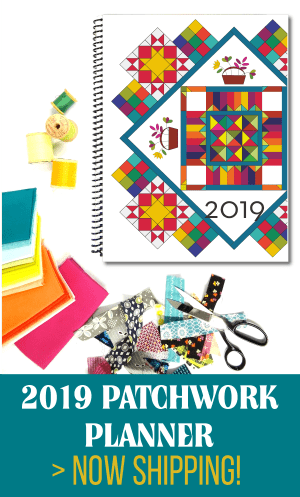 This piece is cut a little larger than your desired finished quilt block and then you stitch all the scraps or strips onto it, square it up and then finish the quilt top just like any other quilt. 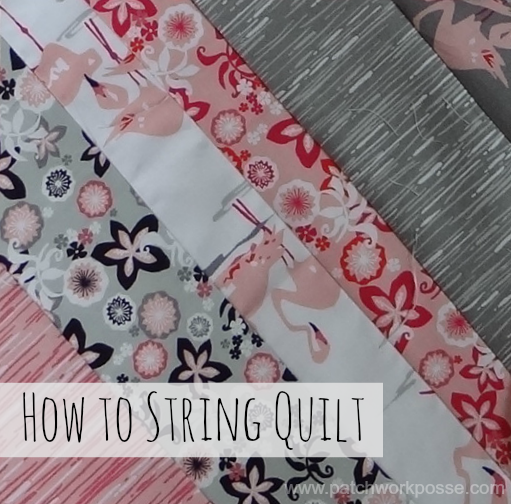 This process is great for using larger pieces or scrappy strips. This is one of the quickest ways to get a bunch of blocks or parts of blocks done all at once. There is no snipping in between stitching. No raising of the needle…getting the next set of fabric pieces stuck in the feed dogs…none of that! You simply feed piece after piece without cutting them apart and ironing them until you have them all done at once. Then you iron them all, then you prepare for the next step. All. At. Once. This makes those patterns that call for 170 quilt blocks manageable. Use what you already have. 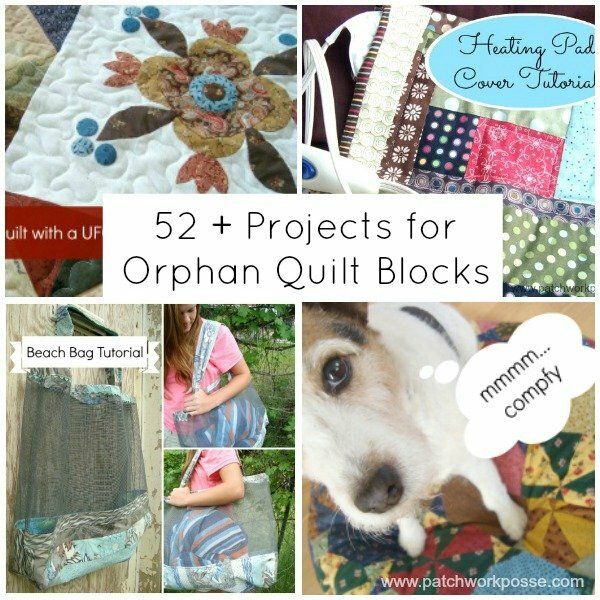 This whole series was based on using quilt blocks that were just sitting in your sewing room. You totally know what I’m talking about. Yup- those blocks that you are not in love with…or it was a tester…or it was a leftover. These are orphan blocks. They are lonely sitting there…and seriously if you want a project done in a quick flash, this is the best pile to pull from. 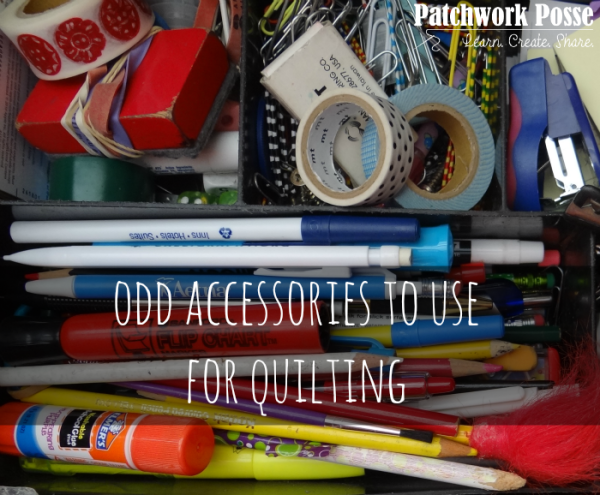 These next few don’t involve any kind of sewing (sadly) but they do help in time management. 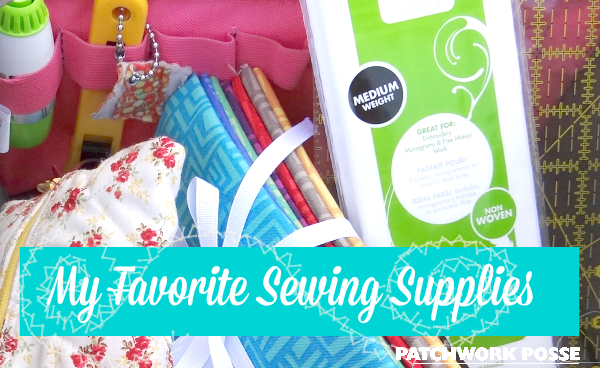 Following a few of these will help you get your sewing done faster and with less stress involved! Now, this one doesn’t actually allow the pedal to go faster, BUT having all the supplies for the one project you are going to start all together can save some serious time. Not searching around for this fabric or where is that darn thread or binding! That is such a pain and I am just like you when I am nose deep in a project. I can’t find anything I need because the sewing spot is in a creative mess. Oh yeah. 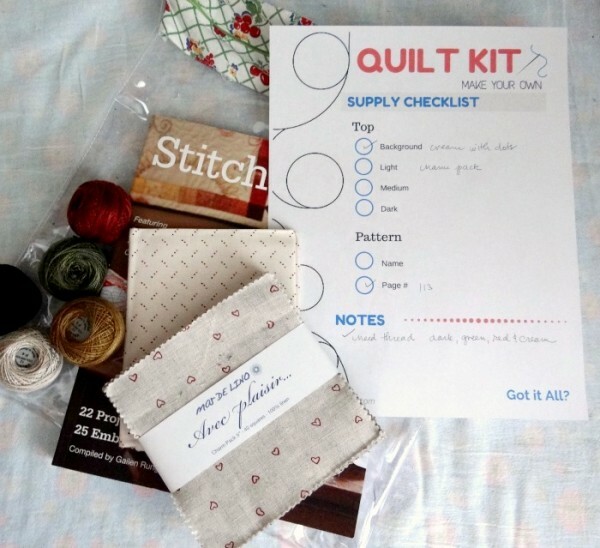 So- print off the paper, gather your supplies and when it’s time to get sewing….. no searching is needed. 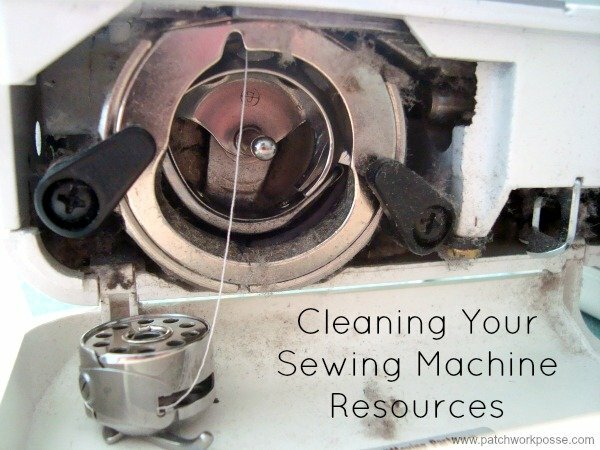 Take the time to get your machine (whether it’s a cheap sewing machine, or a super expensive one) in awesome working order. 5 minutes of cleaning will save you a bunch of time in the end. When things aren’t right on the machine you will be picking stitches out, fiddling with the tension or just plain ‘ol pulling your hair out because something is wrong and you just can’t figure it out! Know what your reading (and what you’re talking about). Nothing is more frustrating than looking at instructions and not ‘getting’ what the heck they are talking about. WIF what is that? 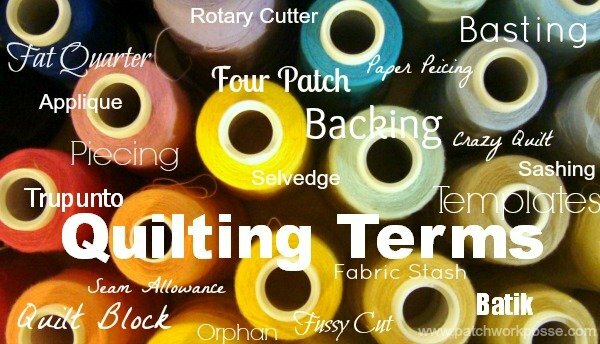 Take a minute to learn a few new terms so you can quickly get to the fun part- the stitching and sewing. Plus, when you are talking about your pattern you can toss out those terms like a pro and everyone will be impressed. wink wink. This is such a challenge for us creative people! There are times when my sewing space is spotless…..for a few days and then other times it looks like a bomb went off for a month! There is no telling where things are and how much or how many of certain supplies I have. This year I’m trying a little harder to keep my space a little cleaner and put together so I don’t have to waste time hunting the piles for what I need. 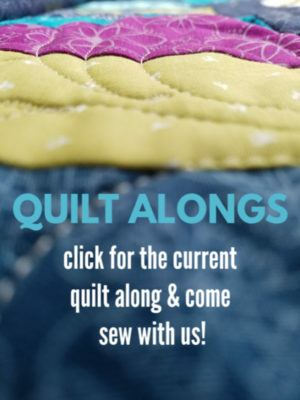 This is a little off…but really if your rotary cutter is skipping a thread every time you use it— it takes time to make that extra little snip and get on with what you are doing! Don’t let your tools get lost in the whole process. You need to make sure that you keep those that you love right close to your finger tips. You need to have your pencils sharpened, your blades sharp, straight pins need to be straight -not bent. Replace that broken or snapped ruler. Having the right tools is really quite important. Not that you have to have the newest and best out there, but what you do have really should be in good working order or it will cause more frustration. Think outside the box. Don’t go for the default – regular rules and accessories. If you ask anyone, I am not one to really follow too many rules when it comes to sewing. This list of over 100 things that will get your wheels turning. You might do a double take on a few things sitting around in your room that you never knew had such potential. Learn a new Technique in little bites. 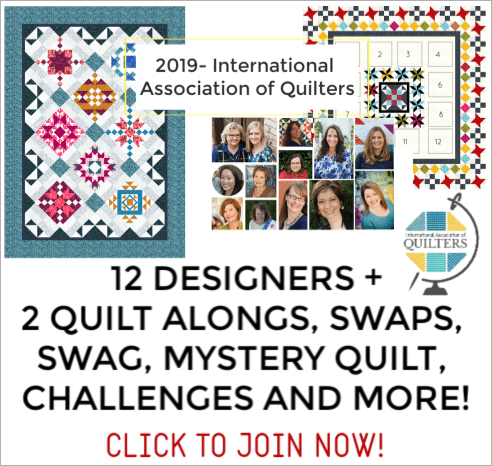 Don’t go all in on a king size quilt with a new technique. That’s not fun. You will find nothing but frustration there. Just take a breath and dive into a new technique with a small project. The mug rug collection is the perfect spot to start. 4 techniques you can dip your toe in and give a try. Not a major commitment in time, fabric, supplies or size. 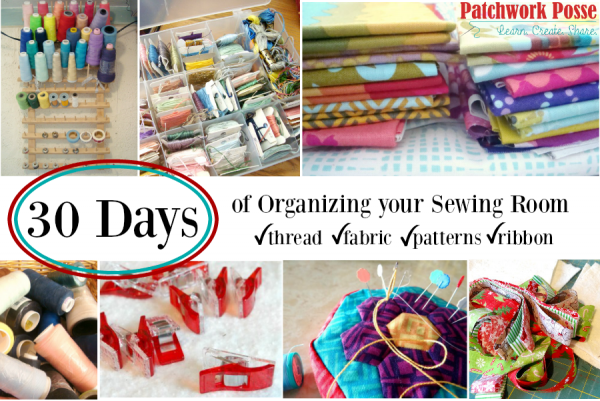 Do you have a suggestion on how to get our sewing projects done quicker? Share it! Thanks for this reminder. I am one who forgets to change my rotary blade, thinking it will last through the next project! How do you throw your blade away? I’m always worried that someone sorting recyclables will cut themselves. I have one of the containers that the blades came in — I store the dull ones for the trash in there. I do mark them with a sharpie with a big x so I know they are used. My favorite odd use item is an old fashioned nut pick. It works as a stylus, poker an stitch remover. It is pointed but not sharp so the possibility of ripping your fabric is minimal. I use a glass jar with lid and put all my broken needles, bent pins and used rotary blades in it. When full then I can put in trash. I use a different size jar (pickle) for each. I then bring them to either a metal recycling center, they dump them in and melt them. Or a local amusement park, has a metal crafter I give them to him. Along with bent needles or pins. He also melts them, then makes something something really unique. I buy candy in a metal box and use this flip lid box for bent pins, old needles, etc. it then is recycled as it is all metal. fun idea to melt them into something cool. I have been trying to change my Club password but unable to. The mail link I should be getting to do so must not be working. Never arrives. Anyone have suggestions?